Rosalyn W. Berne, Ph.D. explores the intersecting realms of emerging technologies, science, fiction and myth, and the links between the human and non-human worlds. As a professor in the field of Science, Technology, & Society (STS) at the University of Virginia, her research interests include new reproductive and emerging bio-technologies, and inter-species communication. Beyond her academic life, Rosalyn uses her perceptual gifts and empathic intuition in working with horses and their human companions. Her publications include academic books, numerous papers, a science-fiction novel, and books in the body-mind-spirit genre. When the Horses Whisper shows the capacity of horses to help us heal the human heart. It expresses in human language what horses have to say when given the chance to speak. It is a story about the bond between horse and human, and the communication made possible when the bond is based on love. Conversations with fifteen horses, most of whom live and work in Costa Rica, are featured along with their photographs, capturing them as individual beings in service to humans on a shared evolutionary journey. This journey amounts to the remembering of our whole selves in the wholeness of creation, especially the parts we split off, deny, and place in shadow because they are too painful. Horses, as the book shows, can help us see these lost parts, and call forth our courage to reclaim them. For the author, these included the loss of a newborn daughter, the mental illness of an adult son, letting go of a thirty-year marriage, and childhood sexual abuse. The story recounts the equine healing work that helped in reclaiming her authentic self. This book is testimony to the power of horses and equine healing work in transforming life’s losses into a deeper human wholeness and a further communion with the non-human world. For reviews, click here. In Waking to Beauty, Rosalyn W. Berne explores the extraordinary experiences that have shaped her spiritual journey. 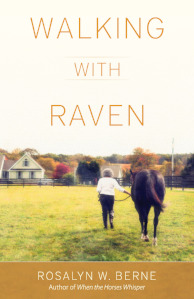 This book follows When the Horses Whisper, which details the author's capacity to “hear” and speak with horses, an unexpected gift that changed her understanding of who we are as human beings, in our connection to other beings. Waking to Beauty considers the early childhood origins of this capacity, and shares the realizations that have flowed from this gift. This journey moved her from an external orientation, with a theistic God dwelling “somewhere out there,” to experiencing the divine as present within us and with our fellow creatures. The crux of the book centers on Rosalyn's encounters with a mare named Beauty, which led her to a profound experience of God dwelling with us here on Earth. The new vision of spiritual evolution that flowed from these encounters opens profound possibilities for humanity, in its interdependence with other living species as well as the earth itself. Beauty makes it clear that human existence is in a precarious state, and that humans need to change in order to survive. But why would anyone take a horse's message seriously? Reading this book may help to provide an answer to that question. Coming soon. The anticipated third installment in this moving series. This book melds essays on biotechnology written by scientists into science fiction stories. It opens a conversation about the morality of what we may one day be, and what it may mean to be human as our biotechnological endeavors continue to evolve. The biotechnology "revolution," launched on a global scale many decades ago, has taken a direct course toward re-creating life. Yet there are still many choices to be made in shaping the future that it may one day make possible. The book motivates readers toward deep reflection and continual discourse, which is essential if biotechnology is to evolve in ethical, meaningful, and sustainable ways. Oriana is pregnant, a rare occurrence in her Nantucket home. Her child should gestate in an exo-uterus, its genetics carefully monitored and altered by VISHNEW, a seemingly omniscient disembodied system that melds the virtual with the real. Most in Oriana’s community view VISHNEW with a mix of adulation and fear, and with reason. Any deviations from the system’s plans are dealt with quickly. Oriana finds herself accused of stealing her VISHNEW-selected mate’s genetic material. Forced to stand trial in the Nantucket Compliance Court for Obstetrical Obedience, she is found guilty of obstetrical obstinacy. The court gives her a choice. Either she allows VISHNEW to immediately connect to her unborn child, or the fetus will be retrieved and her womb immobilized. Oriana chooses a third option—flight. Unsure of even where she’s going, she hides out in an abandoned Quaker meetinghouse, knowing that outside VISHNEW waits. Her only hope for her baby lies with a childhood friend but comes with a terrible price. To save her child, Oriana may have to lose her forever. A provocative tale questioning the power society assigns to technology, Waiting in Silence is reminiscent of The Handmaid’s Tale in its scope and themes. Thanks to the openness of 35 research scientists and engineers, and a “Career Award” from the National Science Foundation, a five-year research project culminated in this book. It’s difficult to determine where nanotechnology is leading, what its pursuit will mean, and how it may affect human and other forms of life. Nevertheless, its research and development are moving briskly into that unknown. It has been suggested that rapid movement towards ‘who knows where’ is endemic to all technological development; that its researchers pursue it for curiosity and enjoyment, without knowing the consequences, believing that their efforts will be beneficial. Further, that the enthusiasm for development comes with no malicious intent but rather from simple ignorance. Contrary to that commonly held perception about the collective pursuit of technological development, there are individual research scientists and engineers who are quite willing to reflect on the meaning of their work in nanotechnology. Nanotalk is a book of conversations and explorations with thirty five such nano-research scientists and engineers who share their ideas, experiences, perceptions, and beliefs about their work, humanity, nature, change, and the future of the world with nanotechnology. Precisely because of the unknowable nature of nanotechnology research and development, conscientious foresight and ethical reflection are warranted every step of the way. Not only do nanotechnology research and development represent enormous financial commitments, but they also require a profound leap of faith regarding its possible outcomes. Using these conversations as the basis of reflection and deliberation, the author explores the possible significance of nanotechnology to humanity and how it might be pursued conscientiously and ethically. We respect your privacy and won't share you personal information.